I like to think of it as "What Now?" Hello. I'm sorry I didn't stop, or wander the 200 feet toward you. My eyesight sometimes isn't the greatest, and I should have come nearer to see who you were, or if you were, in fact, waving at me. There were multiples of you, so hello to you all. I could tell you that I was in a hurry because I had frozen goods in my bags, and it was 184 degrees outside. (This is true, though this was not the reason I did not stop). I could tell you that I was heading home to go to bed. (Not entirely untrue. It was a late night for yours truly, at the Southern Baseball League All Star Game, combined with an early morning at work. Papaw will hitting the hay rather soon). The truth is? I had to poop. Beer. Ballpark Hot Dogs. The heat and humidity. Had to go. First thing I did when I got home. Left the cold stuff on the kitchen counter until I was finished. I hope you're well, and that your evening was free of the singular discomfort I was feeling some 20 minutes ago. Hello. This song has been caught in my head for two days. I want to destroy the Earth with bombs made from Mentos and Diet Dr. Pepper. Friends, the time has come again. I passed the site tonight. The Kiwanis Club has once again done a fine job of setting up the battlefield. The tables are set. The cooking/serving line is ready. Tomorrow, we will bring battle to the people of Athens. This is not my first rodeo. I am a battle-scarred veteran. Tonight, I decided to dust off the old Big Stupid Tommy Blogamathing to share a bit of the wisdom I have acquired in my 30+ years of fighting the good fight at the annual Kiwanis Pancake Day. Folks will try to tell you that this is not a contest. And maybe it is not, in the tete-a-tete sense. There are no actual prizes awarded for eating more pancakes than any of the other Festival Attendees. None that you can put on your mantle, per se, but many that you will wear in your heart for years to come. You see? The Annual Pancake Breakfast is a Contest of Will. Is there any more of an arch-combatant than one's self? No, there are no official competitors. The truest opponent is your personal definition of Enough. All You Can Eat is a dare. Plain and simple. 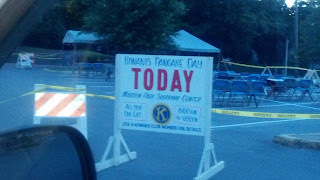 That said, the folks at the Kiwanis Pancake Day will toss you from the playing field if you barf. It works just like the Nathan's Hot Dog Contest. A Reversal of Fortune will get you ejected from the breakfast. Even if you bring a shopping bag or a backpack to deposit the detritus into. I don't recommend getting liquored up for the event. While I'm sure I share your love of bourbon and flapjacks, I have to advise against the course of action for a couple of reasons. First, while it tends to relax your body's normal response to having eaten 28 pancakes and syrup, to allow you to eat more pancakes and syrup, it tends to accelerate the body's tendency toward evacuation. The batter/sugar mixture doesn't absorb the alcohol as much as, say, a Krystal Hamburger, or three pounds of bacon. They won't cook three pounds of bacon for you at the Kiwanis Pancake Day. No matter how much you need it to help absorb the alcohol in your stomach. I have found no bribe to make this happen. Second (or is it third) reason not to drink? It's June, and they serve this breakfast on an asphalt parking lot. While I've written many a letter arguing against this tactic (why can't they hold this breakfast some place like the Astrodome, or perhaps around the pool at the YMCA? Or anyplace with air conditioning not built on top of asphalt? My home has both these requirements. I would vacuum). Regardless, the heat, combined with alcohol, will sap your endurance in the early summer heat. As I mentioned, you are eating pounds of pancakes on blacktop. It will be hot. 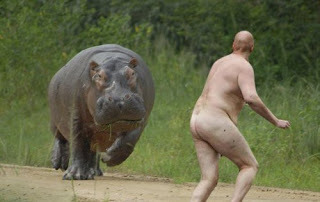 But no matter how hot it gets, and I cannot stress this enough, you MUST STAY CLOTHED. Simply because you have wandered into a Smorgasbord of Gluttony where the normal rules of Polite Human Consumption have been abandoned does not mean you need to ignore all local statutes as they concern the wearing of pants, shirts and underwear at breakfast. I have received no complaints from staff for removing socks or shoes. People stare, but nobody seems to mind if you wear your bathrobe, so long as you keep it belted. Stay hydrated. Again, asphalt in June. Water is good, but a lighter milk (skim? 1%) will do nicely, given the circumstances. I recommend against coffee during such an endeavour. One year, I drank cup after cup of coffee while I ate, and succeeded in burning a hole in my stomach the size of a tennis ball. The helped me eat more pancakes, in the short term. However, the human anatomy is not designed to absorb the nutrients contained within flapjacks via the muscular tissue surrounding the stomach. Actually, I almost died. The nurses at the hospital were cute, as I do like a woman in scrubs. Still, not worth it. Don't fistfight anybody there. Cooks. People taking tickets. Other eaters. Just don't. I know the urge will rise within you. Don't. Just don't. No Fist Fights. Corollary: No fights of any kind. Sword. Gun. Karate. Pencil. Math. Baseball Bat. It's just bad form. Pancake Breakfasts are a Time of Peace. Go easy on the syrup. Two words: Sugar Shits. It's a longshot, but if you eat pancakes well enough, and fantastically enough, you might get to be on TV. And the last thing you want to tell Robin Roberts, Katie Couric, Al Roker or Dan Patrick is that you enjoyed the experience, but hate that you ruined your Tennessee Titans rug in the living room when the quivering bowels hit you. The networks rarely ask folks who talk about diarrhea on the air back. Go easy on the syrup. Another reason: Diabetes. Fun to say. Horrible to deal with. Look, you're eating a fried piece of bleached bread flour. You're already tempting fate. I'm not going to tell you that a pancake breakfast in a small southern town is going to be the most important thing you'll ever do in your life. This year, maybe, but not in your life. There will be one, maybe two more things more important (wedding, birth of a kid, brokering world peace, meeting Pat Sajak are the only things that come to mind). Giving yourself diabetes to broker world peace is one thing. Honestly, the world peace thing seems like a win-win. Softer socks and nobody trying to blow each other up over a religion? Never mind. Sign me up! Go easy on the butter. Another thing that will just grease up the intestinal tract. Seriously. Nobody wants to hear it. Syrup is better than jelly. A wise man once said this. Bring the money with you to get in. You don't want to have to beg. I mean, do it if you have to. Somebody will give in. They always do.